The term ‘Proxy’ is a contraction that comes from the middle English word procuracy, a legal term meaning to act on behalf of another. You may have heard of a proxy vote. Where you submit your choice and someone else votes the ballot on your behalf. In networking and web traffic, a proxy is a device or server that acts on behalf of other devices. It sits between two entities and performs a service. Proxies are hardware or software solutions that sit between the client and the server and does something to requests and sometimes responses. The first kind of proxy we’ll discuss is a half proxy. With a Half-Proxy, a client will connect to the proxy and the proxy will establish the session with the servers. The proxy will then respond back to the client with the information. After that initial connection is set up, the rest of the traffic with go right through the proxy to the back-end resources. The proxy may do things like L4 port switching, routing or NAT’ing but at this point it is not doing anything intelligent other than passing traffic. Basically, the half-proxy sets up a call and then the client and server does their thing. Half-proxies are also good for Direct Server Return (DSR). For protocols like streaming protocols, you’ll have the initial set up but instead of going through the proxy for the rest of the connections, the server will bypass the proxy and go straight to the client. This is so you don’t waste resources on the proxy for something that can be done directly server to client. A Full Proxy on the other hand, handles all the traffic. A full proxy creates a client connection along with a separate server connection with a little gap in the middle. 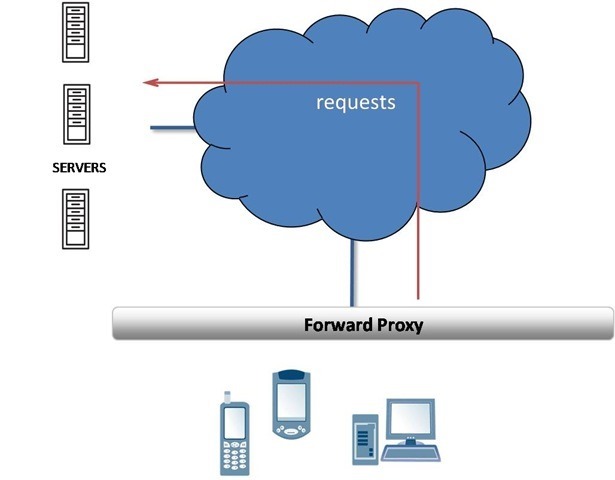 The client connects to the proxy on one end and the proxy establishes a separate, independent connection to the server. This is bi-directionally on both sides. There is never any blending of connections from the client side to the server side – the connections are independent. This is what we mean when we say BIG-IP is a full proxy architecture. The full proxy intelligence is in that OSI Gap. With a half-proxy, it is mostly client side traffic on the way in during a request and then does what it needs…with a full proxy you can manipulate, inspect, drop, do what you need to the traffic on both sides and in both directions. Whether a request or response, you can manipulate traffic on the client side request, the server side request, the server side response or client side response. You get a lot more power with a full proxy than you would with a half proxy. With BIG-IP (a full proxy) on the server side it can be used as a reverse proxy. When clients make a request from the internet, they terminate on the reverse proxy sitting in front of application servers. Reverse proxies are good for traditional load balancing, optimization, SSL offloading, server side caching, and security functionality. If you know certain clients or IP spaces are acceptable, you can whitelist them. Same with known malicious sources or bad ranges/clients, you can blacklist them. You can do it at the IP layer (L4) or you can go up the stack to Layer 7 and control an http/s request. Or add a BIG-IP ASM policy on there. As it inspects the protocol traffic if it sees some anomaly that is not native to the application like a SQL injection, you can block it. On the client side, BIG-IP can also be a forward proxy. In this case, the client connects to the BIG-IP on an outbound request and the proxy acts on behalf of the client to the outside world. This is perfect for things like client side caching (grabbing a video and storing locally), filtering (blocking certain time-wasting sites or malicious content) along with privacy (masking internal resources) along with security. You can also have a services layer, like an ICAP server, where you can pass traffic to an inspection engine prior to hitting the internet. You can manipulate client side traffic out to the internet, server side in from the internet, handle locally on the platform or or pass off to a third party services entity. A full proxy is your friend in an application delivery environment. If you’d like to learn more about Proxies, check out the resources below including the Lightboard Lesson: What is a Proxy? Lightboard Lessons: What is a Proxy?